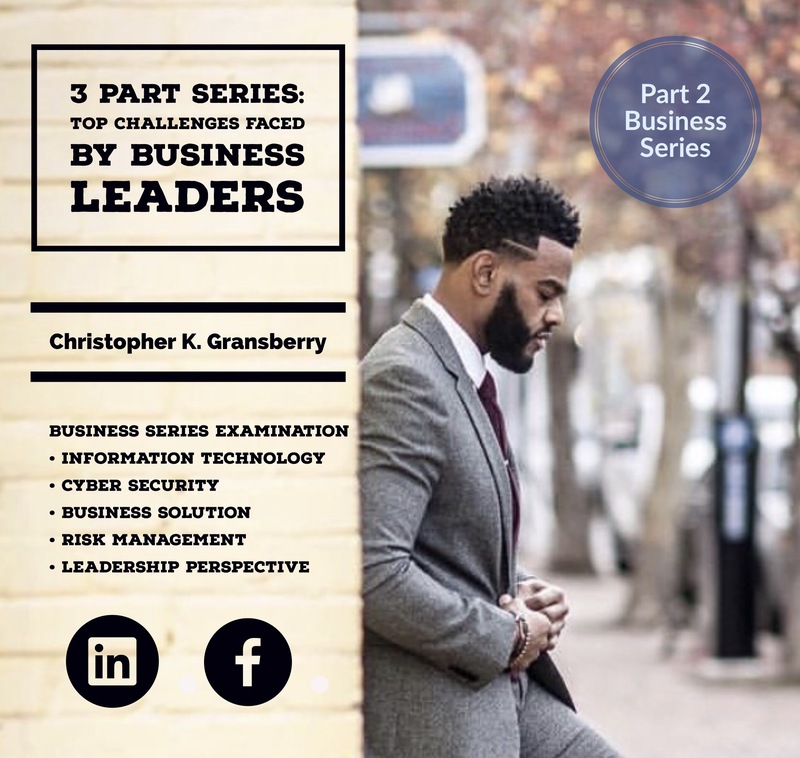 Part 2: Top Challenges Faced by Business Leaders – Christopher K. Gransberry Sr.
With the current rapid growth of the digital ecosystem, there has also been a remarkable growth in threats to the safety of the data stores of many businesses and governments alike. Currently, there has been a proliferation of shocking cyber-attacks that have left a host of big global businesses wrestling for a solution to deal with this menace as noted by Upton and Creese (2014). Cyber security is no longer a mere issue for the information technology (IT) departments, considering highly established firms like Vodafone, JP Morgan and Samsung has been adversely affected by this (Moskovkin, Shigorina, & Popov, 2012). These and other companies as well as government entities have been compelled to pay millions to their customers because of the breach of information, in addition to suffering loss of customers due the perceived lack of confidentiality of their information. Cyber insecurity is taking many forms, some of which include ransom ware, which restricts the systems it affects, cyber espionage and cyber theft, where important business information is being vandalized. The consequences of a company’s data being breached can devastate its reputation and its finances. The tragedy is there is no definite way to obstruct the ever scheming virtual intruders. These intruders are gaining access to immense amounts of valuable and highly sensitive business data such as customer financial information, data on company systems, among other emerging and rapidly advancing problems. To address this problem, business leaders must note that technology alone will not be effective in addressing the problem because intense human capital is being required to establish and uphold these technologies. Indications by Hipkins, Harbaugh, Morris & Aucsmith (2017) aver that since the technological solutions required to address this problem are constantly changing, there is an ever increasing need to provide constant training to the IT professionals responsible for implementing the solutions.